Samar Saed Abdullah’s entire body trembles as she speaks about her impending execution. She thinks of the gallows room, the noose around her neck and that moment when she will take her final breath. “My life is meaningless,” she said, choking on her tears. “I can’t think of anything else. The other women, we try to help each other, but we cannot escape the reality that we are on death row and they can take us at any second.” The 27-year-old Iraqi woman is sentenced to die in connection with the slayings of three relatives in January 2005. She looks pale and frail, her face sallow, her eyes bloodshot. She shakes with each sob, anxiously twisting a tissue in her hands. We first met Samar in spring 2007, at al-Kadhimiya Women’s Prison in Baghdad. She had been on death row for about two years, and she was terrified. Watch a tearful plea from death row » “I don’t sleep at all on Wednesdays,” she said then. 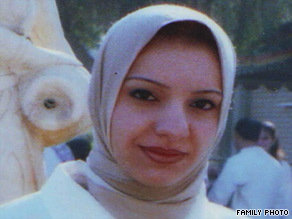 “I stay up from morning until night, because that’s the day they pick for executions.” Samar was sentenced to death by hanging for being an accessory to murder in the killings of her uncle, aunt and cousin — slayings that she says were carried out at their home by her husband-to-be, who remains on the loose. She maintains that she is innocent, and there are disturbing questions about her conviction. Samar has now been moved a step closer to death: to Baghdad’s maximum-security prison, where there are more than 500 prisoners waiting to be executed. It’s the same facility where Saddam Hussein was hanged in December 2006. CNN was not allowed to film her face inside the prison. During the interview, the wardens also seemed to make motions to try to stop CNN from broaching the subject of her allegation that she had only confessed under torture. The day of the killings is seared into her mind. “I think about it every day, every hour. I wake up with it in my head,” she said. “It’s the reason I am here.” There was a point in time when Samar was happy, when her life had meaning and joy. She had a fiancé, Saif Ali Nur, in winter 2004. “I was so happy at the time, when he asked for my hand in marriage,” she remembered bitterly. “I thought that he was honest, that he did not lie to me. It all happened in just two months.” At first, her family didn’t approve of the romance, but they eventually relented. One day, she says, Saif duped her into taking him to her wealthy uncle’s house. He locked her in the kitchen and, she says, shot her uncle, aunt and cousin. Then, he turned the gun on her. Samar says he stole less than $1,000 after threatening to kill Samar and her family if she went to the authorities. The Iraqi police picked Samar up the next day, after Saif dumped her in front of her house and disappeared. She sobbed. “I will never trust a man again. I will never love anyone again. I just want to stay with my parents.” Samar feels betrayed, both by the man she once loved and by a judicial system that is about to send her to her death.